What is Target Search Page Location Bidding? How Does Target Search Page Location Bidding Work? This guide is a detailed look at Target Search Page Location bidding, if you are unfamiliar with this bidding technique or bidding strategies in general; you may want to read our introduction to bidding strategies first. Target Search Page Location is an automated bid strategy that allows you to get your ads o the top of the 1st page of the SERPs. 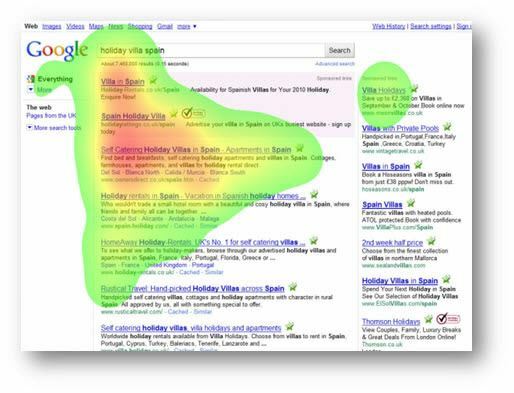 This is important as the image below illustrates; the image shows a heat map of where people look at on the first page of the SERPs. The red areas show the highest concentration of where people look and the green shows the lowest concentration. As this nicely illustrates, your ads are more likely to be seen (and hence clicked) the closer to the top left of the page. Where your ad appears within the SERPS is based on both the bid and the QS (Quality Score) of the keyword triggering the ad. Because most advertisers are interested in traffic, conversions and revenue / profits, this strategy is largely untargeted towards these metrics. You can easily manually adjust bids to improve ad position but this is more often a vanity metric rather than a valuable metric. Being in position 1 does not mean that you will either generate conversions or achieve positive ROAS (Return on Ad Spend) / ROI (Return on Investment). It also does not equate to a CPA (Cost Per Acquisition) and in fact in many cases, being first does not typically equate to any valuable metric. There are relationships between average position and conversion rates, for example; you may find that the higher your ad position, the higher your conversion rate… Whether the increased CPC is low enough to turn a profit with the improved conversion rate is something that account managers will have to test. The only obvious exception to this is with brand campaigns… Often advertisers will want to see their brand specific ads to appear at the top of the SERPs, however keywords containing your brand name often convert at much higher rates than no-brand terms. This can be very useful for brand campaigns; you will typically want your brand campaign/s ads to be at the top of the page when someone searches for your brand. As with all automated bidding strategies this is achieved through AdWords adjusting bids for you to allow your ads to appear either in the top spot or on the first page of the SERPs. You will need to meet the following criteria (see below) in order to use this bid strategy. Search Page Location Bidding can work across many campaigns, ad groups, keywords, etc… Consequently, some will be over and some will be under Target Search Page Location; the aim is that overall (as an average across all components) the Search Page Location will be on target. Using this option will allow Google to up your bids until your ads are showing at the top of the first page of the search results. Using this option will allow Google to up your bids until your ads are showing on the first page of the search results. 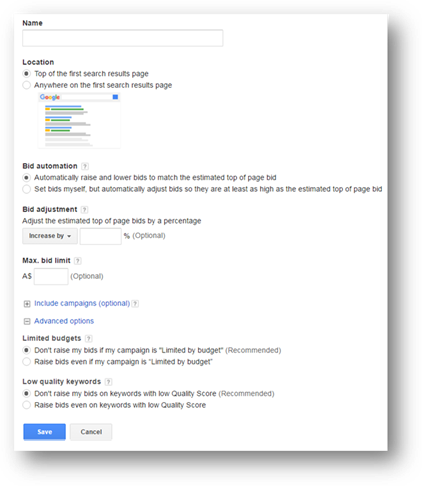 You can set a bid adjustment to fine tune the performance of your ads in the context of the bid strategy you have chosen… Whether its anywhere on the first page or the top of it… If you want to see a change in CPC or ad position, either up or down, you can set a bid adjustment here to do so. “Low Quality” keywords refer to keywords with a low QS (Quality Score) … Trying to up bid these can cost a lot of money… In fact, the reason for the low position of keywords with a low QS is linked to the low QS. It is highly recommended that this be left on the default setting, which is “don’t raise bids on low quality keywords”.